I appreciate fantasy artwork both for its aesthetic merits and for its importance to selling fantasy novels. They say you should never judge a book by its cover but I will freely admit that there has been more than one occasion on which I have been drawn to read or buy a book because of a spellbinding illustration on the cover that has made me just itch to find out more. Some illustrators have become as synonymous with certain writers’ work as the words themselves – it is difficult to imagine Alice in Wonderland without John Tenniel’s iconic sketches, Dickens and Phiz go together like salt and vinegar, and even today most editions of C S Lewis’s Narnia novels are adorned with the illustrations of Pauline Baynes. Perhaps the most perfect example as far as fantasy novels go of an author and illustrator being artistic soul-mates is that of Alan Lee and J R R Tolkien. Alan Lee is an illustrator who is best known for his fantasy artwork. 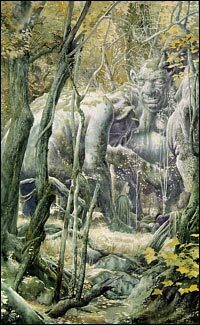 Apart from Tolkien’s work he has also famously illustrated Faeries (with Brian Froud), Lavondyss by Robert Holdstock, The Mabinogion, Jan Siegel’s Fern Capel trilogy and the haunting Merlin Dreams. In each case the author has praised Lee for capturing perfectly the spirit of their work and it is now something of a badge of honour for any writer to have Lee’s illustrations on the cover of their book. Lee’s style is perfectly suited to the fantasy genre. Watercolour is a commonly seen medium in his work, along with pencil for his sketches, giving his pictures a very earthy, natural quality. His artistic contributions to the novels of Tolkien are particularly noteworthy, and it is easy to see why. Tolkien was the master of evocation in his writing, painting mystical landscapes with his words that made his imaginary world of Middle Earth come to life in the reader’s mind. Since Lee excelled at drawing gnarled woods, pitted stone monuments and fantastical creatures, his style was therefore a natural fit for Tolkien’s world – as can be seen from the pictures above and below. Despite being a highly respected fantasy artist for many years, Lee might have escaped the notice of the wider public had it not been for his work on the production of Peter Jackson’s Lord of the Rings movies between 1999 and 2001. 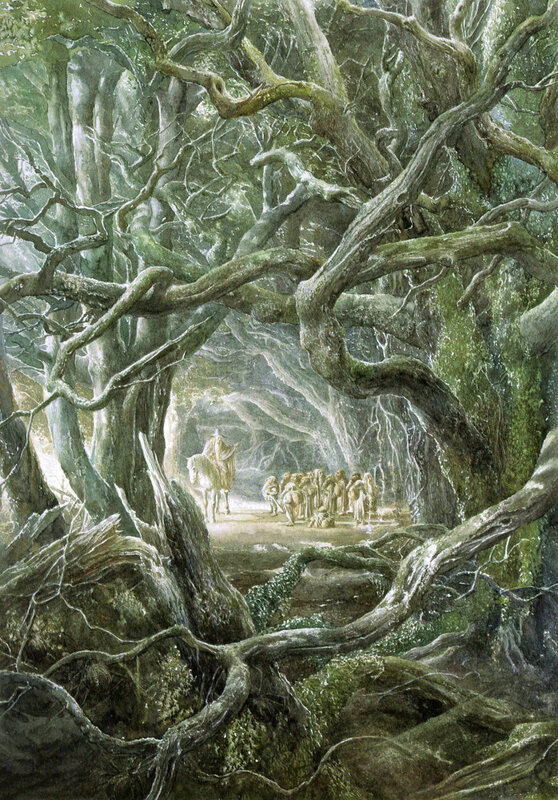 Long an admirer of Lee’s Tolkien art, Jackson saw him as the perfect conceptual artist for the film trilogy and went to great lengths to hire him (together with John Howe, another renowned Tolkien illustrator). Jackson managed to contact Lee, a rather reclusive man, in his home in the south of England by couriering a package to him. This contained two of Jackson’s previous films, Forgotten Silver and Heavenly Creatures, with a note from himself and his partner Fran Walsh, which piqued Lee’s interest enough for him to become involved in the film project. He went on to subsequently illustrate and even help construct many of the scenarios for the movies, including objects and weapons for the actors. Lee also makes a cameo in the opening sequence of The Fellowship of the Ring as one of the nine kings who became the Nazgul! Lee was rightly rewarded for his contribution to the film series with an Oscar for The Return of the King – a rare reward indeed for an artist and a testament to the man’s extraordinary talent. On the subject of fantasy art, I keep meaning to say your header image is BEAUTIFUL! I agree, your header is lovely! And I didn’t know that A.L. was in the movie either! Excellent- didn’t know about Lee’s appearance in the films! I can always spot PJ and his kids in each, but now I’ll have to see if I can sot Alan, too. Acting is another of his many talents! Cool! I also don’t know about Lee’s appearance… which is great, since I plan on having another LOTR marathon weekend soon. I’ll keep my eyes open! When I was a child I saved up for months to buy the Lord of the Rings. I could have gotten the paperbacks much cheaper but I wanted the hardback Alan Lee illustrated version because his pictures fit so exactly, I was very excited when I found out he was doing concept art for the film. He has always been my favourite of the Tolkien illustrators and probably my favourite fantasy book illustrator in general as well. I will have to watch out for the cameo now too! 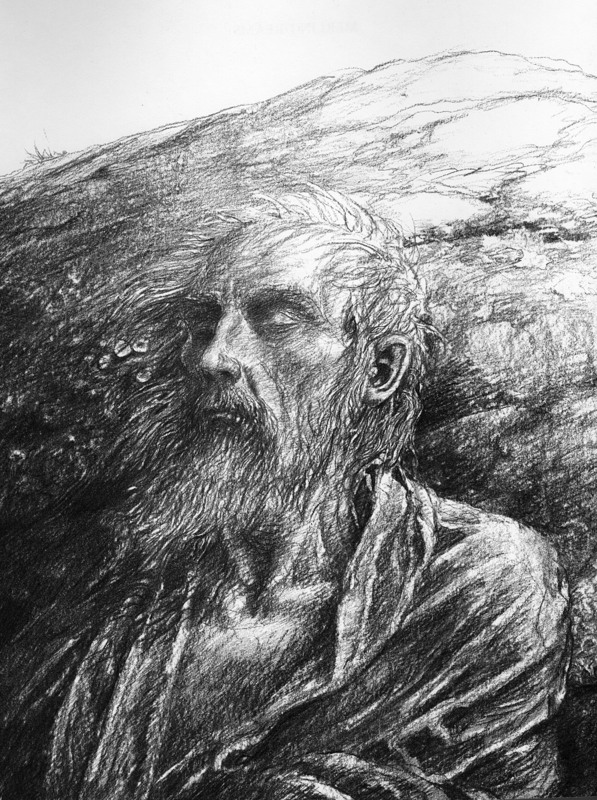 Alan Lee is amazing! I was fortunate enough to meet him once in Philadelphia at the Free Library where he gave a wonderful lecture. His work is so inspiring. And I totally agree that I judge a book by its cover too! I am going to follow this blog. I love his work- was just admiring an illustration of Olwen from the Arthurian tales he did in 1981.